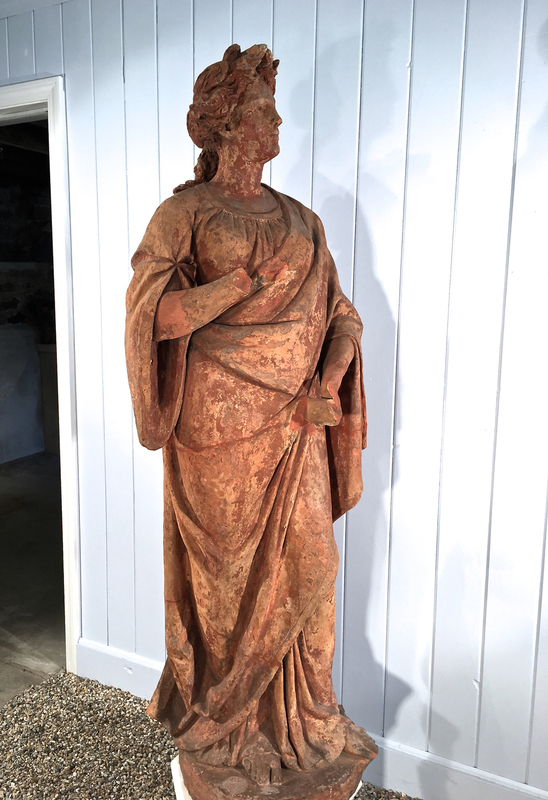 It is rare to find a life-size garden terracotta statue of such age that, other than missing its hands, is in remarkably good condition. Stamped on the base, the maker is illegible, but one can make out that she originated from Milan. This life-sized statue of Flora, Goddess of Spring, is magnificently-sculpted and hand-pieced and the details on her hair and dress make this a work of art that will command admiration for centuries to come. Suitable for interior or exterior decoration, Flora would make an outstanding focal point at the center of a boxwood parterre or in a foyer, conservatory or dining room. If placed outside, she will need to be covered in winter unless your climate is mild year-round.